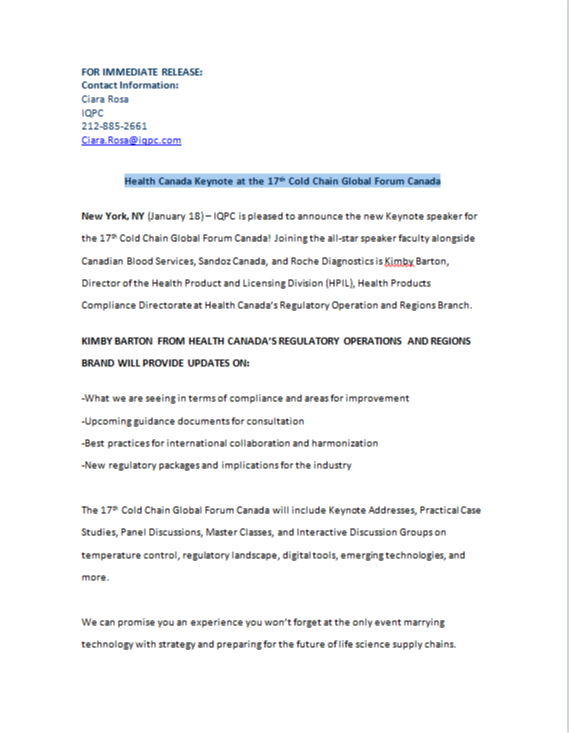 IQPC is pleased to announce the new Keynote speaker for the 17th Cold Chain Global Forum Canada! Joining the all-star speaker faculty alongside Canadian Blood Services, Sandoz Canada, and Roche Diagnostics is Kimby Barton, Director of the Health Product and Licensing Division (HPIL), Health Products Compliance Directorate at Health Canada’s Regulatory Operation and Regions Branch. View the press release to learn more about Kimby Barton and her Keynote session.